Internet Income University Review - Skill Pay Closed Down?!? Internet Income University Review – Skill Pay Closed Down?!? Internet Income University Review – Skill Pay – Is Internet Income University legitimate or scam? What is it all about? Has it closed down? Reviewed here. Update (Sep 2016): skillpay.com is also defunct now. Overview: Now defunct Internet Income University has become Skill Pay. 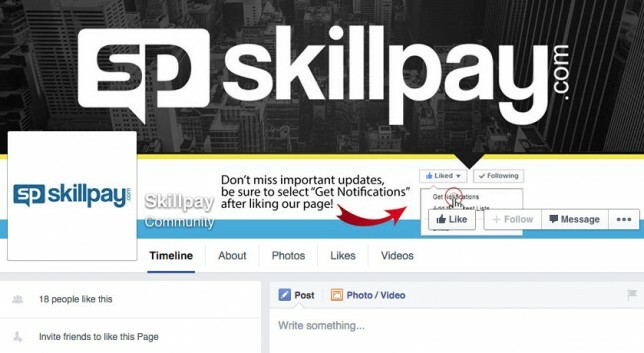 Skill Pay provides training (general ones) and a Facebook community for socializing and Q&A. However, Skill Pay has closed it door to new members. Internet Income University Review – What is it all about? I caught Internet Income University out of the corner of my eye while I was reading another review. The word “University” intrigued me to find out more because I am from Wealthy Affiliate University. It is always good to know what the other university is offering in their training. When I typed in the URL internetincomeuniversity.com at my browser, this website URL was redirected to skillpay.com instead. This made me even more curious about this Internet Income University. A few more rounds of searching for answers at Google, I came to the conclusion that Internet Income University has officially closed and redirect all their customers to Skill Pay. I took a tour at Skill Pay and want to explore deeper at Skill Pay because they offered FREE Starter membership like Wealthy Affiliate University too. Due to wildly successful training and education Skill Pay was providing, their sole focus is moving forward to assist their existing members. Seemed like a big loss to new members who wanted to join. I am again curious to find out how wildly successful they are and head over to their Facebook community. I am expecting a lot of exchanges and hope to learn one or two new things from there. 18 people liked this! Wildly Successful? I really felt that something was wrong with Skill Pay at this point. Scam alert siren is sounding! But hey, if you are still interested in 1-on-1 coaching, prepare at least 10 grand before Kevin and Darin are willing to speak to you. Would you jump right in? I won’t, because there are free resources available elsewhere. Internet Income University Review – What’s inside Skill Pay? To appease your curiosity too, let us look at some training offered at Skill Pay. This is a “niche generator” to help you to narrow down what subject topic you want to blog, promote and monetize your website. Premium Member access only. This is a very generic training that teaches you how to create a Facebook Page. Free Member can access. Rightly it should be. Can learn for free elsewhere too. Information provided here are pretty basic such as creating an account with FaceBook/YouTube, how to log in to your WordPress for dummies. They are Free, though. Premium Members can access to more videos in these sections, but again some information you can get for free readily by doing a google search. Not much of a value to me either. In this section, Skill Pay owners teach you what is Google Adsense, Click Bank, and Amazon.com and how to monetize from them. Seriously? There are free training out there too! In this section, Skill Pay owners are training you about mindset such as Setting Goals. They also tell you how to build an E-mail list and Brand building. These are very generic information available elsewhere for free. How many times have I said available elsewhere for free? Internet Income University Review – Skill Pay worth the price when the membership was still open? They have closed their membership, but let’s look at what was the price offered at Internet Income University – Skill Pay as a comparison to Wealthy Affiliate University. 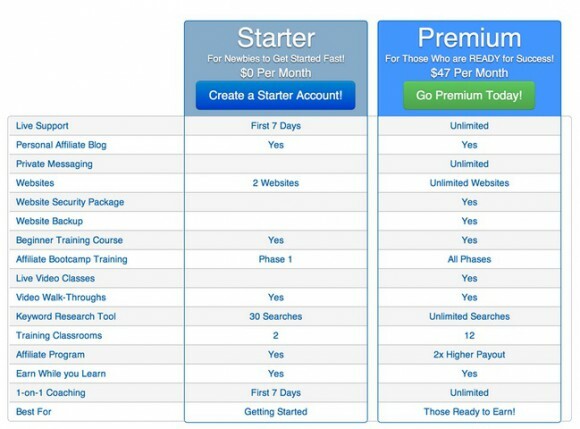 From the comparison, you can see that Wealthy Affiliate University offers much more for Free* Starter Member. 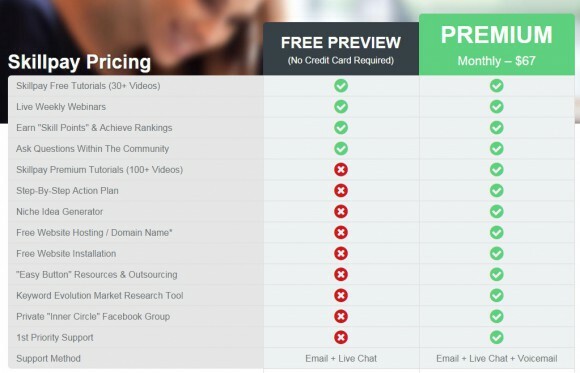 For Premium Member, even more at a lower price. Given the generic training provided, minus the hosting cost at Skill Pay, it is not worth to even pay those for $10/month! Personally, I would have chosen Wealthy Affiliate University if both were layout in front of me, even if Skill Pay was still open. I am still giving Internet Income University – Skill Pay 1.0 stars because of the effort Kevin and Darin had put in creating the training and videos. I am not able to access the free training and videos due to closed membership so I am not able to comment on their quality and usefulness. Seems to me that they have other more important business to focus on and left this site as-is now. If ever they are going to re-open the membership in the future, their training may be already outdated. Skillpay.com is now defunct also. So they are gone from the Online World permanently. *Please note that some countries are not able to enjoy FREE Starter Membership due to Wealthy Affiliate University’s Anti-SPAM policy. ← My Survey Review – Is My Survey Legitimate or Scam?! ?